Earlier this year, my principal and ITC suggested that I try flipping the classroom in some way with my 1:1 iPads. My biggest concern with a flipped classroom approach is the loss of interaction students have with their learning and with their peers. Most flipped lessons are just videos that students sit and watch at home. How can I be certain they are watching at home? How can I guarantee they won’t click play, turn around, and continue on with their video game? Furthermore, how will this extra work on my part help me teach better? Meanwhile, I struggle everyday with not having enough independent reading and writing time for my students. At a Title I school where many students lack the model or motivation to read and write at home, school is it. I also do not have enough time to work with all of my students. When you have 45 minutes allotted for writing workshop, fifteen of those minutes are used for the mini-lesson and about five to ten are used at the end for share/reflection time. This leaves only about 20 minutes of independent writing time! Below is my solution to all my concerns. It has achieved more than I imagined it ever would. Flipping the reading and writing workshop in this particular approach has accelerated the pace of learning, maximized student engagement, and strengthened my teaching. How can I be certain they are watching at home? I discovered Touchcast both as a web app and an iPad app. This is a video app like no other. You create a video just like you normally would except you are able to embed interactive “vApps” which include things such as a white board, websites, pictures, or polls. There are tons of them and you can even create your own. These vApps show up right on the video screen and will work once you TOUCH them. This solves one of my main concerns about flipped lessons; I know my students will have to actively watch the videos. How will I use these videos to teach? Each Touchcast video is a mini-lesson that I would usually teach during my reading or writing workshop. Touchcast has a five minute time limit so it takes some planning. The order is identical to Lucy Caulkins’ mini-lesson structure. My connection is brief and quickly leads to my teaching point. The teaching point is always written at the bottom of the screen. I model by using the whiteboard feature or just simply video recording. The active engagement part is the key component that makes Touchcast video stand out from the rest. 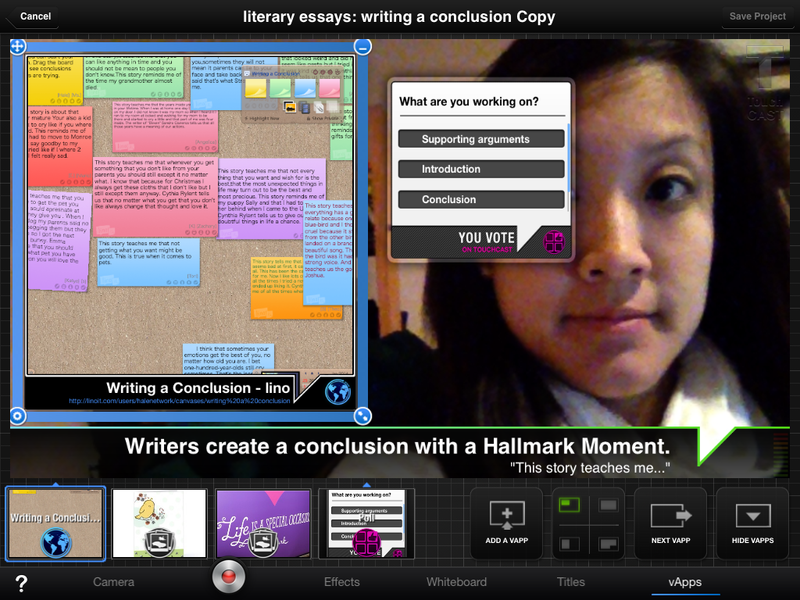 I often embed a collaborative board called Linoit as a website vApp into the Touchcast and ask students to post their task on it. The link at the end is very brief. How will this “extra work” on my part help me teach better? Linoit Board – great for at home peer learning and formative assessment! This is the best part. I have found at least two major advantages a Touchcast flipped lesson offers that a typical flipped lesson or workshop mini-lesson can not offer for a teacher. Firstly, a Touchcast flipped lesson helps the teacher filter away the typical ramblings and create an extremely clear and concise lesson. An in-class mini lesson usually takes about 10-15 minutes whereas the Touchcast lesson forces the teacher to reduce it down to five minutes. No time is wasted on extraneous information. Meanwhile, the student can pause or re-watch the lesson at their own pace. The second major advantage has to do with the active engagement part. Initially, I wanted just an active engagement piece in the video that lets my students still learn from peers even at home. 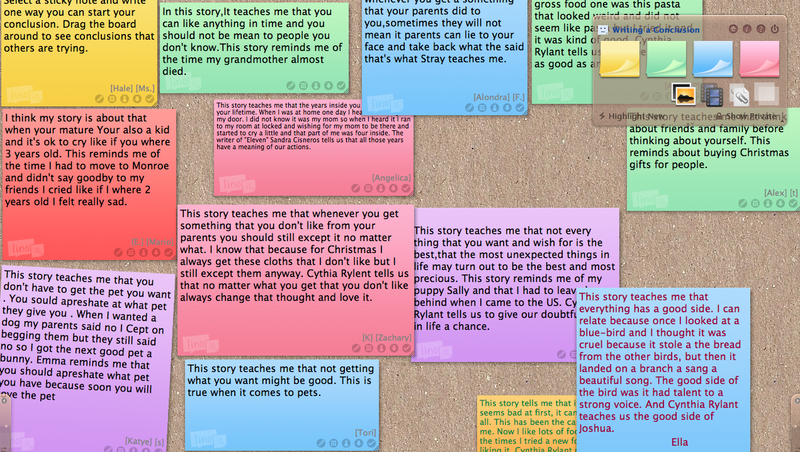 What I didn’t realize was that these posts on Linoit would accelerate my teaching time. Before my students even arrive the next day, I was able to assess my students by reading their sticky notes on Linoit and move the sticky notes into strategy groups. Assessment = done! So what does this mean for my in-class workshop structure? Well, those 15 minutes spent each day on a mini-lesson are now an extra 15 minutes for independent reading or writing. The 10-15 minutes time spent during workshop to walk around and assess student progress is no longer needed. That extra time equates to at least one extra small group lesson for me! If you are doing book clubs, a flipped Touchcast lesson means more book club meeting times or more lessons on book club skills. 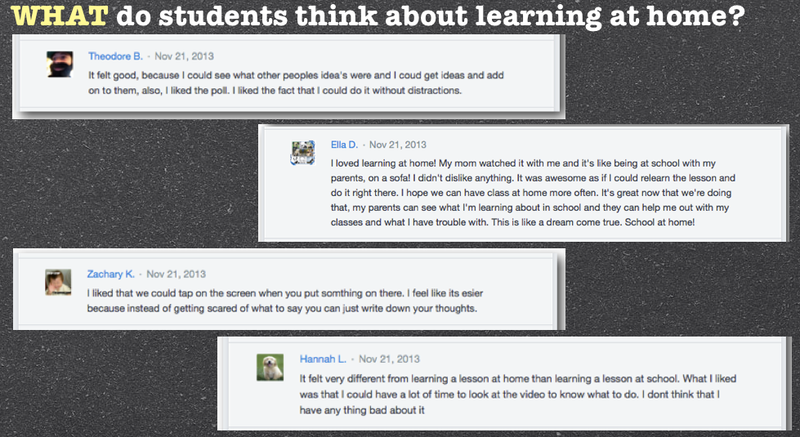 After my very first interactive flipped lesson, I asked my students to give me feedback on Edmodo. Here’s what they said. I encourage you to rethink flip lessons as one that is interactive or collaborative. I also strongly recommend incorporating an opportunity for some formative assessment during your flip videos. Have you tried flipping your reading and writing workshops? If so, please share!! Hi Katharine, I’m so excited to find your post. I’m currently getting my masters in literacy and I’m finishing my research paper on Flipping my Reading Interventions Class. Really, I did a faux flip because I did not assign videos for homework. Students went through a sequence of steps every class. My mini-lesson was recorded for them to watch, then they conferenced with me, ann finally practice the strategy in their independent books. I noticed similar things you did. Engagement increase, I work one-on-one with students a lot more, and there’s more time for independent reading. I”m looking forward to checking out touchcast. I would love to share more resources. I teach 7th and 8th special education grade in a Chicago suburb.